The Bloody Mary Mix of the Month Club is perfect for any Bloody Mary fanatic! 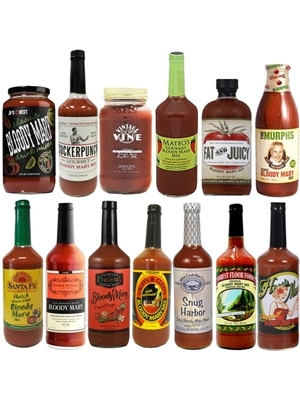 Have you ever noticed that it is really hard to find a decent selection of Bloody Mary mixes locally? Still in search of that mix that is just right? If so, then this club is for you! Each month we look for unique, hard to find mixes from smaller, regional producers. Take a look to the left for examples of some of our featured selections. Each month includes one (typically quart sized) bottle of mix (vodka not included). If you want the ultimate Bloody Mary experience, select the Deluxe Bloody Mary of the Month Club option which in addition to a Bloody Mary Mix, also includes two other items such as olives, pickles, pickled veggies, rimmers or hot sauce to make a more complete Bloody Mary experience! NOTE: this club can only ship to the Continental United States. Shipments typically arrive toward the end of each month. Would you like us to send a personalized gift greeting? Paper gift greetings are sent via USPS on beige post card sized heavy card stock inside an outer envelope. Gift greetings (paper & email) are sent in the afternoons Monday through Friday for orders placed before noon (CST). Should you have special requests regarding the timing of gift greetings, please indicate them in the order notes section at checkout. Click here for information on Christmas orders. No Yes, via USPS to recipient. [Add $0.49] Yes, via USPS to purchaser. [Add $0.49] Yes, via email. Your personalized message will be sent along with a description of what your recipient will be receiving and when they should expect the initial shipment. Please indicate who the gift is from in your personalized greeting.